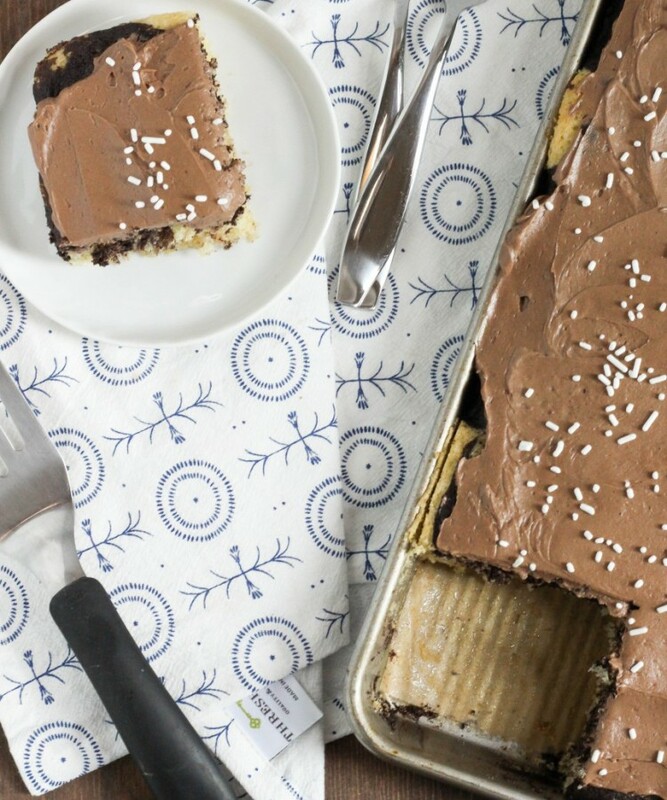 Have I told you guys lately how much I love baking in sheet pans? (hint, yes). 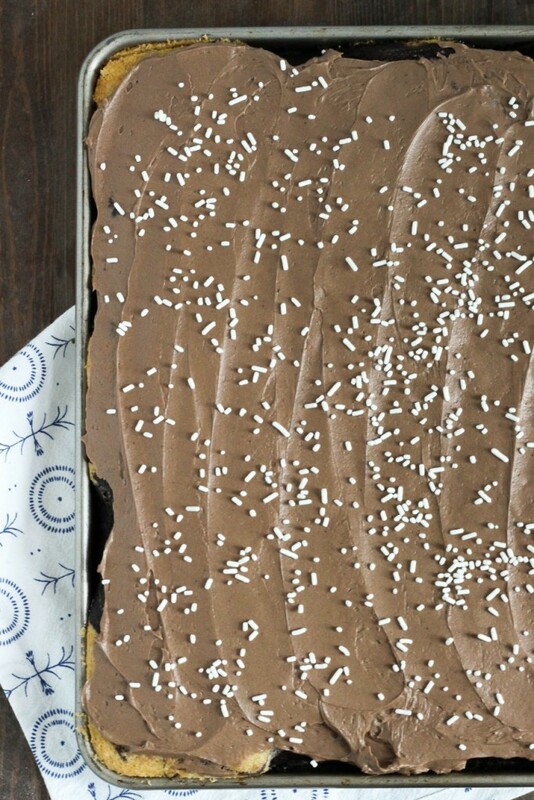 Sheet cake is something I normally don’t do. 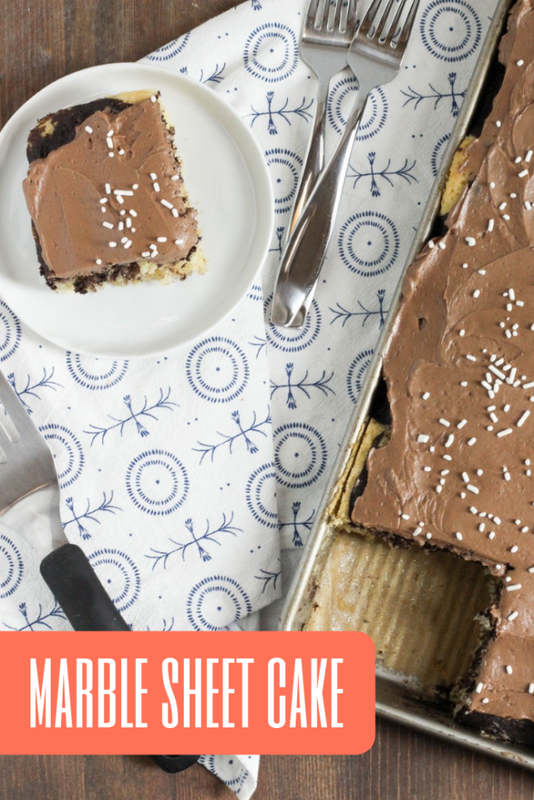 Actually, when I think of sheet cake, the first (and pretty much only) thing that comes to mind is Texas sheet cake, which I don’t like. Something about that icing I guess. And so normally I don’t bake cakes in sheet pans. BUT, it’s another super easy way to bake for a crowd. You get a TON of cake out of this recipe, but you only have to bake and frost one layer. And actually traveling with a sheet pan is super easy, so it’s the perfect thing to take with you. 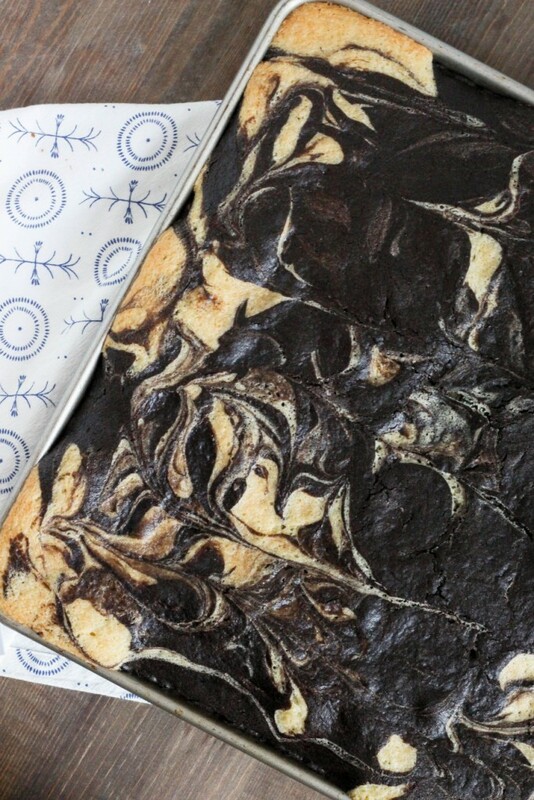 So anyways, the marble part of this cake recipe was born from my indecisiveness. Actually, I’m convinced that’s how the entire idea of marble cake was ever thought up to begin with. I really wanted cake, but I didn’t know which kind, and sometimes it’s just. Why not both? And I know what you’re thinking, what the heck is mayo doing in this recipe? So here’s the thing- I like to add something for moisture to many of my cake recipes, and it’s often sour cream. But hey, I have a 3 month old baby, and I could not just run out to grab some sour cream, and it turns out that mayo is a solid substitute. Keep it in mind folks, it’s easy, and it DOES NOT make the cake taste like mayo, I promise. 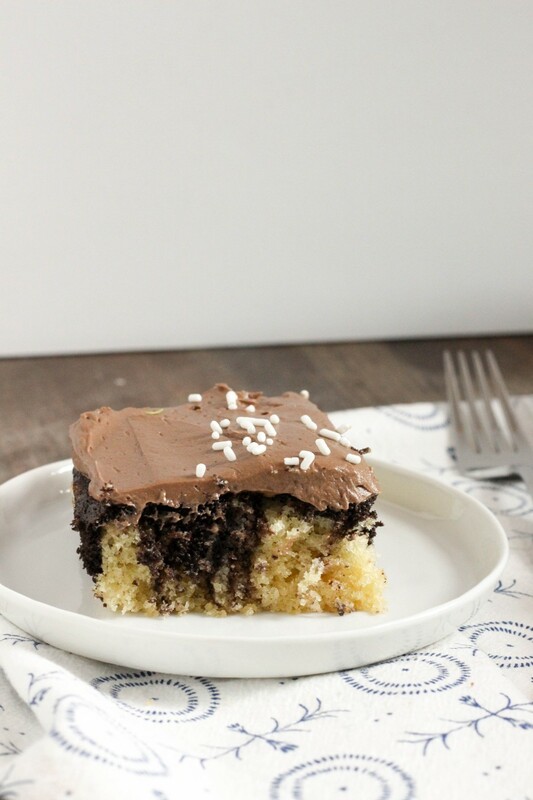 The recipe is super simple, just a very basic cake recipe, and you use the same batter for vanilla and chocolate with just a couple additional ingredients. The frosting is just a simple American buttercream, which is the easiest to make, and it packs a lot of sweetness. Because of that, we’re working with a super thin layer of frosting, I promise you won’t need more! 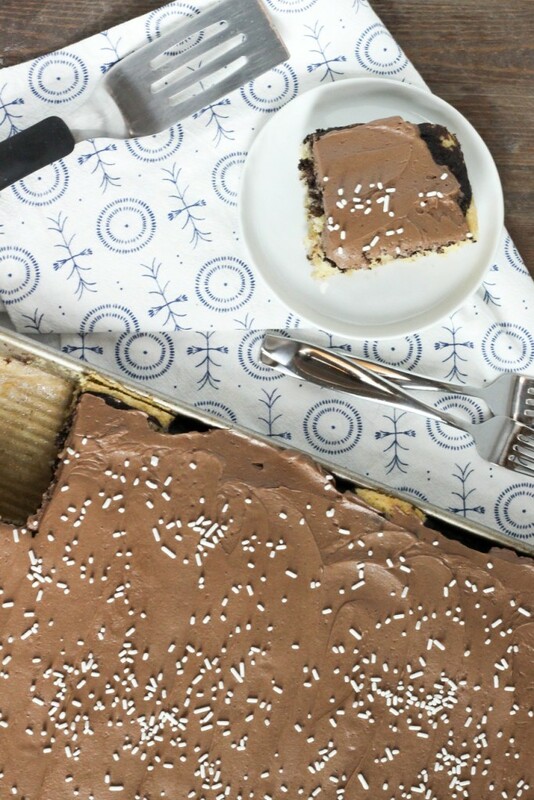 Preheat your oven to 350 degrees, and line a half-sheet pan with parchment paper. Lightly spray the pan with cooking spray. Set aside. In a small bowl, whisk together the boiling water and cocoa powder until a smooth, thick paste is formed. Set aside. In a large bowl, beat together the butter and sugar until fluffy. Add in the eggs one at a time, mixing between each addition. Beat in the mayonnaise and vanilla. Add in the flour, baking powder, and salt, and beat until combined. Then, beat in the milk and mix until the batter is smooth- it will be fairly thick. Pour about 1/3 of the batter into a medium bowl- it does not have to be exact. Beat in the cocoa powder-water mixture to the 1/3 batter until completely combined. 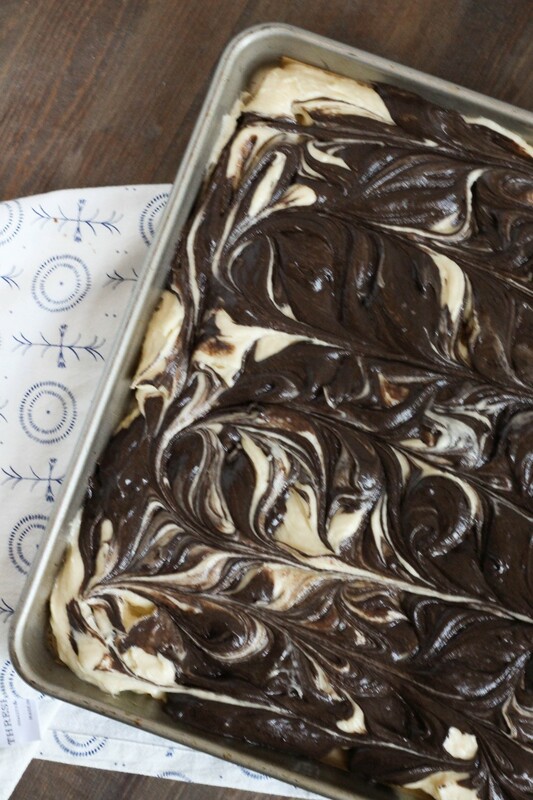 Scoop the vanilla batter onto your sheet pan with an ice cream scoop, leaving spaces for the chocolate batter. Then, scoop the chocolate batter onto the pan as well. Using a spatula, spread the batter to the edges of the pan. Then, use a butter knife to swirl the batters together. Bake for 20 minutes, or until a cake tester comes out clean. Cool completely before frosting. Beat together the butter, powdered sugar, salt, and vanilla until smooth. Beat in the melted chocolate, and then the heavy cream until the mixture is fluffy. Spread evenly onto the cooled cake. There won't be much excess here, so you'll need to spread it thin. Enjoy!